Paul Capsis is an acclaimed singer and actor, renowned for his uncanny, emotionally charged cabaret performances in which he 'channels’ divas such as Judy Garland, Janis Joplin, Marlene Dietrich and Billie Holiday. He is currently playing Riff Raff in The Rocky Horror Show . Yvette Coppersmith saw his solo show Boulevard delirium and 'sat beaming all through it. But I wouldn’t have thought about painting his portrait then as he felt too removed,’ she says. Two years later, the idea was proposed by a purchaser of her work who happened to be a close friend of Capsis. They were subsequently put in touch, met in Melbourne and spent several hours talking and sketching and walking through the rose garden at the local park. The garland is made of antique roses, which feature a lot in paintings by the old masters, and echo the pattern in the fabric. 'Visually they seemed right for the image, which is very much like an icon,’ says Coppersmith. Born in Melbourne in 1980, Coppersmith has a Bachelor of Fine Art (Painting) from the Victorian College of the Arts. 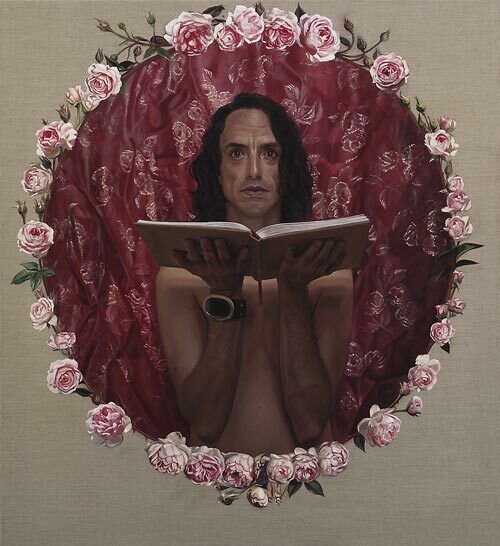 A full-time portraitist, she has had solo exhibitions at Blindside and Linden Centre for Contemporary Art in Melbourne. She won the inaugural Metro5 Art Award in 2003 and has been a finalist every year since. She has also been a finalist in the Portia Geach Memorial Award twice and the Doug Moran National Portrait Prize three times. This is her first time in the Archibald Prize.